I admit it. This is a test entry. I've set up my flickr account to send photos to this blog. That way I can add a little more flair to the blog. 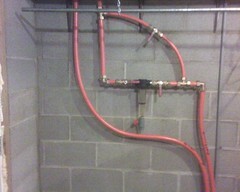 This photo shows a very nice installation of a bypass filter installed by the homeowner, a mason by trade. I love the way the Pex-Al pipe sweeps around in contrast to the block behind it, almost organic.